Many dividend ETFs are down on the year, and trailing the S&P 500 as well. 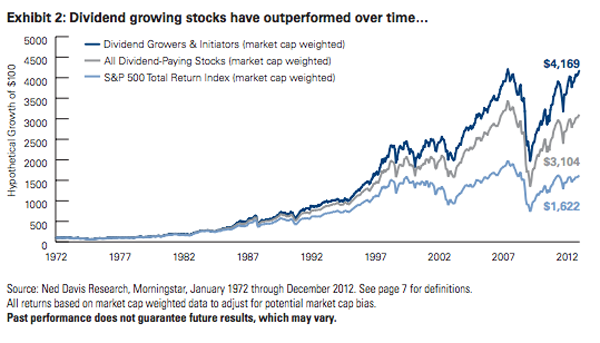 But dividend-focused strategies tend to outperform the market over the long haul. Which means, in theory, it’s a good time for “set it and forget it” income investors to start new dividend ETF positions or add to new ones. But there are 100+ ETFs that claim a dividend focus. And believe it or not, many of them have underperformed the market since inception – not good considering their inherent advantage! Let’s first narrow the field by discussing what types of dividend-payers tend to do the best. Then we’ll review a short-list of five ETFs. Are you worried about the likely December rate hike? Research from investment firm Nuveen shows that dividend growers outperform their counterparts for the 36 months after a Fed rate increase as well. This should be a key component of any dividend-focused ETF you buy. A nice current yield is, well, nice. But the growth component is key – and I’ll show you why. The iShares Select Dividend ETF (DVY) pays 3.4% today. It dwarfs the S&P 500’s 2% yield by focusing on bigger payers like utilities, which make up nearly one-third of the current portfolio. Unfortunately in reaching for yield the fund forgoes dividend growth – a case of first-level income thinking that has cost DVY over the long haul. 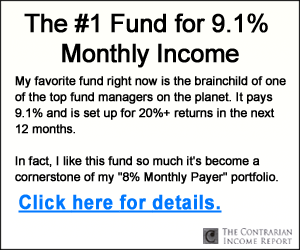 This fund gets a lot of ink online, and I don’t know why. The S&P 500 has nearly doubled it up since inception twelve years ago (94% returns to just 49%). Its hefty expense ratio of 0.4% hasn’t helped, and isn’t justified either. The iShares Core High Dividend ETF (HDV) is better in practice and theory. It pays 3.9% today, charges just 0.12% in expenses, and screens companies based on Morningstar’s “business moat” formula. This means the fund only purchases shares in companies that have a sustainable business advantage (as determined by the analysts at Morningstar). Conceptually, it’s a good approach to dividend growth. But it hasn’t yet panned out. HDV beat the S&P for its first two years, but underperformed the last two (and currently trails 54% to 45% since its inception). The big problem I see is outdated moats. Exxon (XOM) and Chevron (CVX) make up 16% of the portfolio. Unfortunately Morningstar’s high-paid analysts haven’t come around to the fact that big oil remains a big dividend trap. The Schwab U.S. Dividend Equity ETF (SCHD) wins the expense war. It charges just 0.07%, and pays a 3.1% yield. It tracks the Dow Jones U.S. Dividend 100 Index, which picks stocks based four criteria: cash flow to debt, return on equity, yield, and 5-year dividend growth rate. 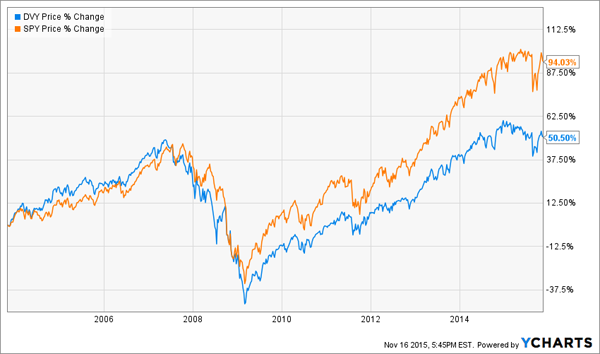 SCHD is trailing the S&P by a margin of 69% to 54% since its 2011 inception. But there’s hope for the future, as the index itself has returned 10% annually since it was created on December 31, 1998 (a 17-year period in which the S&P 500 only gained 67% total). Ironically SCHD has only half the weight in Exxon and Chevron as HDV, showing that a simple screen may be smarter than the aforementioned analysts. This fund should beat the market going forward if its index’s past success is any indicator. The Vanguard High Dividend Yield Index (VYM) also pays 3.1%. It’s beat SCHD head-to-head to date, but still trails the market with nearly a decade in the books. It tracks the FTSE High Dividend Yield Index, which aims to buy global stocks that are forecasted to pay the biggest dividends over the next 12 months. The index’s complex set of rules seem to be doing more harm than good. Since inception VYM is trailing the S&P by a margin of 49% to 35%. Peak-to-trough in 2007-08 it actually fared worse than the S&P itself, which is difficult to do if you’re buying dividend payers. But at last – there is one ETF that would make the Ned Davis and Nuveen researchers proud. It actually has beaten the market since its birth in 2008. The Vanguard Dividend Appreciation ETF (VIG) is an index comprised of companies that have increased their dividends for at least 10 years running. It has Microsoft (MSFT) and International Business Machines (IBM) in its top six – two tech payers we’ve discussed before. In aggregate its portfolio companies are growing earnings by 5.4% annually – enough to power future payout boosts. Why are most dividend ETFs dogs? Their big problem is that their formulas, by nature, are primarily “backward looking.” They use historical yield hikes as an indicator of future growth. That’s sometimes the case – but not always, as businesses change and become obsolete over time. My preferred “set it and forget it” portfolio is a trio of stocks that I handpicked from sector that’ll never become obsolete. Believe it or not, these three companies are paying 7%, 7.5%, and 8.2% today, which is more than triple VIG. They’re all growing their payouts at a meaningful clip and will continue to do so for years to come. 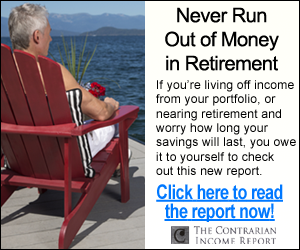 You can get the full details on these “perfect income investments” right now AND the details on how my second-level analysis uncovered it.